SEMI-FINAL IN THE WORLD LEAGUE KNOCK OUT CHAMPIONSHIP !! We are very satisfied to inform our loft is ready for the semi-final in the World League Knock Out Championship towards a very good Italian loft by Cristiano Paltrinieri. The quarter-final towards the Spanish loft Domingo Mario Diaz Acos was won after good performance at today's 160km race in Talent Quatro. The semi-final will take place at Algarve Great Derby 1st of September and the distance will be 180km. This year we participate with 8 birds in Algarve Great Derby and the status after Hotspot Race 1 is still 8 birds left. 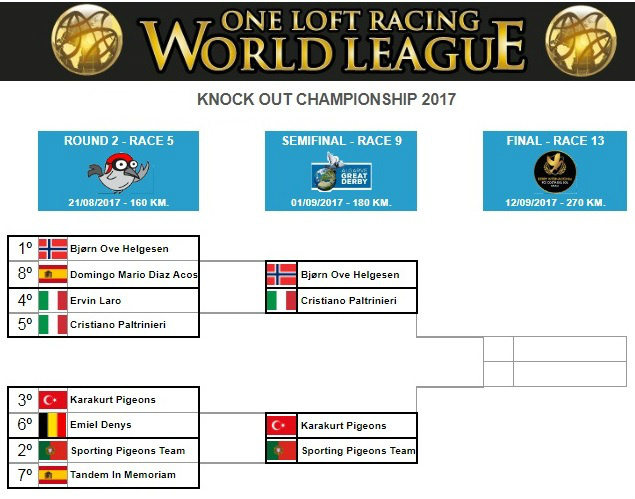 It looks like Cristiano Paltrinieri have the same status (8 of 8 birds), so this semi-final race can be very excited to follow. The other semi-final will be raced by last year Corabia ACE Fond winner (525km 565km) and 2nd ACE General (6 races - 2029km) Karakurt Pigeons towards the good Sporting Pigeons Team from Portugal.